As many breeders know, air powered filters provide more effective filtration per dollar spent than any other aquarium filter available. Air powered filters are low cost to purchase and extremely low cost to operate while providing reliability far above magnetic impeller power filters. A power filter can clog and overflow. A power filter’s impeller can get stuck from a momentary electric power failure. A power filter’s impeller wears and makes noise. A power filter can get air-bound, lose prime and stop moving water. All these issues do not affect air driven filters. Even a dirty totally clogged air driven filter will still move water from the air bubbles rising in the tank and keep your livestock alive! Air driven Box Filters can be filled with the media of your choice; Ceramic rings, Polyfiber sheets, Floss or Filter Sponge Slugs, Carbon or Resin, Buffering Agent like Crushed Coral for raising pH or Peat Moss for decreasing pH. 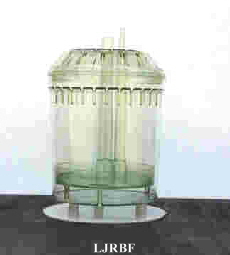 Comes with raised plastic base as shown. 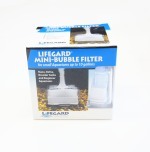 Box filters can be used in aquariums where sponges can’t be used such as with fish that will eat sponge. Plecos, other catfish as well as many herbivores like Tropheus and other algae grazing Malawi cichlids. Box filters are also popular due to the visibility of media condition. 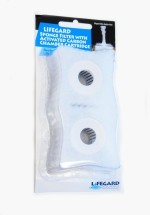 Unlike sponge filters, it is apparent when media gets dirty in a box filter. includes airstone w/ airline tubing, floss & carbon.